Start with your right hand. Fake a fast start towards the right. At this point your defender believes you are driving to the basket with your right hand. Block your start spinning clockwise at 180 degrees while bouncing the ball in your back from your right hand to your left hand. The basket should be in your back when you catch the ball in your left hand. As soon as your ball is in your right hand, continue spinning the remaining 180 degrees while bringing the ball back to your right hand between your legs. 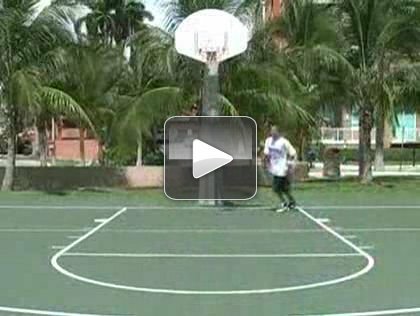 As soon as the ball is in your right hand, fake another fast start towards the right and bring the ball back to the left hand by bouncing it behind your back.